HomeGabion products contribute to the development of a hydro-agricultural infrastructure in the Senegal river Valley. 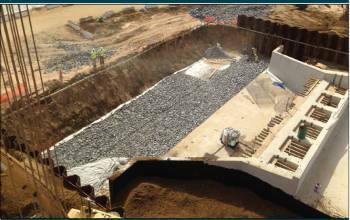 Gabion products contribute to the development of a hydro-agricultural infrastructure in the Senegal river Valley. The Millennium Challenge Account (MCA) donated $ 540 million throughout a five-year time span (2010-2015) with the goal of poverty reduction. In light of this, a plan was devised to develop water resources in the Delta and the Senegal River valley. The project was divided into two segments: (1) the realization of the hydraulic model of the Delta and (2) the development of flood basins in Podor. For this purpose, 165 km of natural rivers were subjected to a process of rigorous cleaning, whereby weed cutting and containment measures were taken to ensure permanent availability of water and improve water conditions. Both water associated-consultant groups—EGIS and IDEV Ic—chose to integrate Maccaferri’s sustainable gabion solutions into their hydraulic structures. The Euronorm, EN 10223-3, a Hexagonal Steel wire mesh and wire product for civil engineering purposes, is the reference for these works; the choice of wire mesh defines the life expectancy of gabion structures. Our gabions are heavily galvanized with GalMac zinc-aluminium alloy with and additional polymer coating delivering a design life over 120 years in certain environments (EN 10223-3 refers). Not only are gabion installations environmentally beneficial and easy to install, but their monolithic formation is also light and flexible, and ideal for drainage. Ultimately the gabion solution will also be instrumental in fostering social integration in the short term among the local population. For more information on the project please contact us. To read the Case Study present on Maccaferri France’s website click here.